Although Amir Khan and Chetan Bhagat both stopped themselves on writing/ speaking anymore over the controversy, but this controversy still shows the true face of Indian Cinema and reflects that why we are still struggles to get a mere Oscar for any category in years. There are numerous examples of lifted stories from all over the world, which made into top box office hits (likes of Ghajini, Murder etc) and sure one should not get surprised, if VVC shouts over Journalist on calling movie 70% based on Five point someone, after all they paid 11 lacs to Chetan for the story at least as Indian Directors really think in this way. 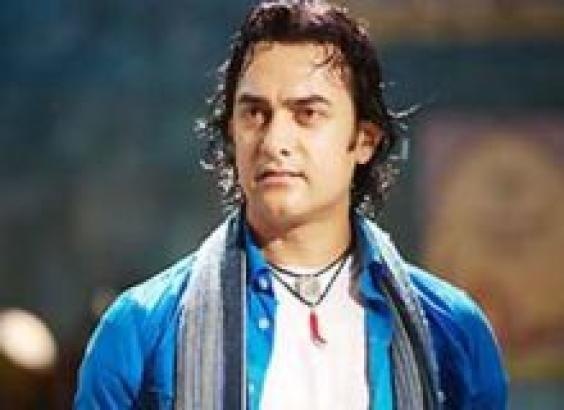 Amir Khan; The man known as perfectionist, famous for his policy of signing only one film per year only claiming that it helps concentrating on quality, the one man, who really given us hope to achieve Oscar Awards for India, the man, who directorial debut “Tare Zameen Par” still known to be biggest contribution to Indian Cinema in its kind, the man, whose name in credits is kind-of-guarantee for the success. His Lagaan almost made it to Oscars and Ghajini became highest grossing Indian Film of all time. He has worked in only 40 movies (as I know) in span of 36 years (1973-2009), but still known as one of the biggest Indian male actors in front of many actors, who might have done hundreds. Chetan Bhagat; the man, who really made many of Indians read English novel, who earlier thought that what fun in reading something, if you need to keep a dictionary in side to understand. The Delhi born Ex-IITian, Ex-IIM is known for his unique writing style, which tends to be simple, with linear narratives and vivid storytelling. He has written only four ‘English’ novels (Five Point Someone, One Night @ Call Center, Three Mistakes of my life, Two States), but his each of novel sells like hot cake in this non-English country, which one could compare only with the phenomenon that how Devki Nandan Khatri made millions of people learn Hindi only for reading Chandrakanta and its successor stories. With my trend of being late into things, here I am back again over issues between Chetan Bhagat and Team 3 Iditots. I was really surprised and even mentioned in my review over the movie that Story writer’s name list should include Chetan Bhagat’s name and “Dont know why not mentioned”, but that time I was not aware that this has already made a big bang across the country and sure it should have been. Legal obligations aside, but for me, on the moral grounds, its insane to write off that Three Idiots only loosely resembles 3-5% with the novel Five Point Someone and so the name of Chetan could not be included and shown in writer’s list. Complexity of legal contracts aside, whom many of us might not even read completely (for example students living outside may check their room rent agreements and all of us could check our employment letters), most of us still feel assured in light of best practices & moral obligations on the other side only and come to learn the things in hard ways only, so is Chetan. Here is the copy of legal contract in pdf. The controversy started with the release of movie to theaters, which was 25th December 2009 and after the same, messages of congratulations were not only heading to Amir, VVC and Hirani team, but in kind of more numbers to Chetan Bhagat itself. Thousands of emails of stunned fans writing that why not they are able to see the name of Chetan in credits (Its there for a snap of time, but not in stories sections), were bound to made the novel writer to comment upon. Chetan, who is also a columnist with Dainik Bhaskar & The Times Of India, and writes on political issues, chosen not to comment over the same through these papers or media and as claimed in his blog post, first attempted to contact Team Three Idiots via mail, SMS and Phone, but probably found them more busy in celebrating the success. Obviously helpless Chetan (might have gone through his contract papers and got to know that technically they can up to an extent), who was not having enough to file a case against them, thought to answer their readers himself and dragging Team Three Idiots into court of morality though his blog posts and tweets and the controversy begin. Vidhu Vinod Chopra and Rajkumar Hirani aside, many of the fans might have not expected Amir to comment in this way against legally almost helpless Chetan Bhagat. But there were many comments from the actors himself, which sure deepen the pain felt by the Author. “ He is trying to take away the credit from the film’s writer Abhijat Joshi, which I am very upset about. It is an attempt on his part to try and take the credit away from the person who has actually worked on the script. It’s very unfortunate. There should not be any confusion to anyone that Abhijat is our film’s writer. " " But in my opinion the credit should be given to Abhijat. For three years, this man has worked on the script. Nobody knows him, but Chetan is a big star. " " Abhijat has written the script and Raju Hirani worked on it. Raju and Abhijat took the idea from Chetan’s book. The starting point is Five Point Someone, but after that the script has changed entirely. " Although Amir Khan and Chetan Bhagat both stopped themselves on writing/ speaking anymore over the controversy, but this controversy still shows the true face of Indian Cinema and reflects that why we are still struggles to get a mere Oscar for any category in years. There are numerous examples of lifted stories from all over the world, which made into top box office hits (likes of Ghajini, Murder etc) and sure one should not get surprised, if VVC shouts over Journalist on calling movie 70% based on Five point someone, after all they paid 11 lacs to Chetan for the story (even if they don’t understand that right to adopt is another thing and right to story is another) at least as Indian Directors really think in this way. Its a story about three students Hari, Ryan and Alok in IIT (Top College of Engineering), who try to cope up/ survive against the monotonic education system. Its a story about three students Farhan, Rancho and Raju in IEC (Number one college of Engineering), who led by Rancho try to fight up/ survive against the monotonic education system. The narrator of the movie is Hari, whose status lies between the rest two individuals; revolutionist Ryan and fearful Alok and who finds himself admirer of Ryan from the day one. The narrator of the movie is Farhan, whose status lies between rest two indiduals; charismatic Rancho and fearful Raju and who finds himself open admirer of Rancho from the day one. Ryan stands against the hostel ranging from the day one, which marks his introduction into IIT. Rancho stands against the hostel ranging from the day one, which marks his introduction into IEC. Alok’s house with invalid father and poor mother with a sister of marriageable age and Maruti car as dowry. Raju’s house with invalid father and poor mother with a sister of marriageable age and Maruti car as dowry. “Define Machine” was the question Ryan answered in his ways and was thrown out of class. “Define Machine” was the question Rancho answered in his ways and was thrown out of class. Hari get smitten by Neha; the daughter of HoD. Rancho got smitten by Piya; the daughter of HoD. Alok jumps out of the institute roof because they are caught stealing papers and get lots of bones broken but still survives the life. The stealing was influenced and helped by Neha; daughter of HoD and three were caught cause Hari calls Neha from Office Phone. Raju jumps out of the roof because Professor Virus tells him that he will be expelled from college, if he does not admit that Rancho and Farhan are responsible for his housebreak get lots of bones broken, but still survives the life. But paper stealing scene is also there in the same way here the stealing was influenced and helped by Piya; daughter of director and three were caught cause Rancho calls Piya from Office Phone. Character of Venkat;the studios guy for whom Alok leaves his friends so that he could get good grades although suffers badly with him in funny ways. Alok comes back to his friends leaving Chatur when Ryan helps his invalid dad. Character of Chatur Ramalingam; the studios guy for whom Raju leaves his friends so that he could get good grades although suffers badly with him in funny ways. Raju comes back to his friends leaving Chatur when Rancho helps his invalid dad. The water tank of the college, where all three used to go out and drink rum & bear there. In his job interview, just came from hospital Alok speaks out from heart in polite and simple ways that why he tried to commit suicide and why his marks gone so bad in fear and Kamal; the selector there still dramatically selects him for the job on his honesty. In his job interview, just came from hospital Raju speaks out from heart in polite and simple ways that why he tried to commit suicide and why his marks gone so bad in fear and the selectors there still selects him for the job on his honesty. This is not the end of list for similarities and sure there are many many differences (as one I pointed out that Chetan titled his novel as what not to do in IIT, while Hirani made it to say that how to), but still its not that hard to decide whether the similarity is 3-5% or 70% and who should be given the credits for storyline. I really recommends you all to buy and read the book (it should be only Rs. 75/- or little more than that), so that could really come to know how life in IIT is and how original work FPS was, why Chetan and his readers feel hurted …. rather than thinking that this controversy is another means of getting publicity for already well known Author or the novel Five Point Someone. Good one!!! Really impressive. Liked the way issue was analysed and put in words. Its not dean buddy. He is Just the HoD. Thanks for the corrections suggested by you. I apologise for the mistake. Mentioned in my last article that its long back, when I read the novel and although have thought to re-read the same but not getting time… So such mistakes might come. Although still it should not be an excuse, thanks for pointing out. Although I have seen a few other posts doing the job much better than me… I thought to put a perspective with facts here. Happy that people are liking the same..
Great comparison and support for Chetan Bhagat. Why don’t you post some comments on Aamir Khan’s blog http://www.aamirkhan.com/blog ? I did not want to take the liberty to post this link there. In the pdf of the contract you posted the most important clauses of the contract made between Chetan Bhagat and Vinod Chopra are missing. Page two of the contract must contain clauses 2 – 7. Could you make arrangement to have them posted in full? Otherwise the purpose of posting a pdf is not fulfilled. Priya, Thanks for pointing out the same.. although I fear I cant do anything about the same as the pdf link is coming from Vidhu’s official website. Although as per my view, that’s immaterial to review the contract file, as if Team 3I is confident this much on the basis of that contract, then I fear there is nothing much in that contract. There is mention that they will give the credit, but its not mentioned that credit should come on a still screen or in rolling names or it should be in writers section or somewhere else. I re-checked the file and it contains all the pages.. might be the case that you didn’t downloaded it full. The exact size of the PDF is 3.64 mb. Try to re-download, if the size is not the same. can you please tell me the name of the case of this controversey, so that i can know the judgement for study purpose?